Mysuru: In a show of strength and unity, the coalition partners — JD(S) and Congress — held a joint rally at the sprawling Maharaja’s College Grounds here last evening. The rally was aimed at sending a strong message on following ‘Coalition Dharma’ and fight the LS Polls unitedly to defeat the BJP. Addressing the gathering, JD(S) Supremo and former PM H.D. Deve Gowda said that both the parties would work together for ensuring the victory of coalition candidates — C.H. Vijayashankar from Mysuru-Kodagu, Nikhil Kumaraswamy from Mandya, R. Dhruvanarayan from Chamarajanagar and Prajwal Revanna from Hassan LS seats. Maintaining that the coalition Government was formed in the State in order to keep the BJP out of power, Deve Gowda said that the coalition Government during its last 11 months in power has continued with the programmes of the previous Siddharamaiah Government besides announcing farmer loan waiver and introduction of many schemes aimed at welfare of the poor. Emphasising on the need to oust the BJP Government at the Centre, the former PM said that the JD(S) is contesting in 7 LS seats while the Congress is contesting in the remaining 21 LS seats in the State. Pointing out that he has asked all JD(S) Legislators, leaders and party workers to wholeheartedly campaign for coalition candidates, he expressed confidence that the coalition can win majority of seats if the workers of both the parties work in close co-ordination. Appealing the party workers to forget the past and look at the future, Deve Gowda stressed on the need for workers of both the parties to shun differences and put up an united campaign. Lashing out at PM Modi for ridiculing the family politics of JD(S), Deve Gowda said that he was a 24×7 politician and he has the strength to take on Modi. Asserting that he is a son of the soil, the former PM appealed the electorate to vote for coalition candidates and thus ensure that Modi does not become the PM again. CLP leader and former CM Siddharamaiah, in his address, hit out at Mysuru-Kodagu LS seat MP and BJP candidate Pratap Simha. Accusing the BJP MP of doing little for the constituency after being elected five years ago, Siddharamaiah said that the Congress has aligned with regional parties in southern States in order to keep the BJP at bay. Maintaining that he has been campaigning along with JD(S) Supremo H.D. Deve Gowda from the past few days, Siddharamaiah underlined the importance of an united fight to check the BJP which he said was a communal party. Alleging that Dalits, Minorities and other weaker sections of the society live in fear under Modi’s rule, the CLP Leader condemned the BJP and RSS’ plans to change the very character of the Constitution. Accusing the BJP of not doing anything for the welfare of the poor, Siddharamaiah said that Modi had only protected the interests of mega corporates while completely ignoring the common man. Claiming that Modi has nothing to boast of as the PM, Siddharamaiah lashed out at PM Modi and MP Pratap Simha in singular, accusing them of making false claims on development. Ridiculing Modi’s ‘Main Bhi Chowkidar’ campaign, the former Congress CM said that the ‘Chowkidar’ had slept when the rich committed frauds and left the country. Terming PM Modi as a liar, Siddharamaiah hit out at the BJP for carrying out I-T raids on Congress and JD(S) leaders. He appealed the electorate to reject the BJP and vote for coalition candidates in all the LS seats. District Minister G.T. Devegowda, in his address, said that just as JD(S) Supremo Deve Gowda, who came from a village in Hassan district, went on to become the PM, Siddharamaiah, who hails from Siddaramanahundi village in the taluk went on to become the CM and ruled the State for full five years. Maintaining that he has no differences with Siddharamaiah, GTD said that he would campaign along with Siddharamaiah in Chamundeshwari Assembly segment on Apr.14 and poll rallies will be held at Kadakola, Jayapura, Yelwal and Siddalingapura. Asserting that leaders and workers of both the parties were taking out joint campaigns, GTD said that Prof. K.S. Rangappa and former MLA Vasu were campaigning together in Mysuru, State JD(S) Chief and MLA A.H. Vishwanath and former MLA H.P. Manjunath in Hunsur, MLA K. Mahadeva and former MLA K. Venkatesh in Periyapatna, MLA Tanveer Sait and JD(S) leader Abdullah in NR Assembly segment and former MLA M.K. Somashekar and JD(S) leader K.V. Mallesh in KR Assembly segment. Former Minister Dr. H.C. Mahadevappa, in his address, stressed on the need for consolidation of secular forces in order to dethrone the BJP Government at the Centre. He appealed the electorate to vote for coalition candidates for development of the country. He also appealed the workers of both the Congress and JD(S) to work jointly for ensuring the defeat of BJP. MLC C.M. Ibrahim too addressed the gathering. Mysuru-Kodagu LS seat coalition candidate C.H. Vijayashankar of the Congress, Minister C.S. Puttaraju, MLAs Tanveer Sait, Yathindra Siddharamaiah, K. Mahadev and Ashwin Kumar, Mayor Pushpalatha Jagannath, KPCC Women’s Wing President Dr. Pushpa Amarnath, MLCs R. Dharmasena and K.T. Srikantegowda, former MLAs Vasu, M.K. Somashekar, H.P. Manjunath and Venkatesh, JD(S) leaders Narasimhaswamy, K.V. Mallesh, Prof. K.S. 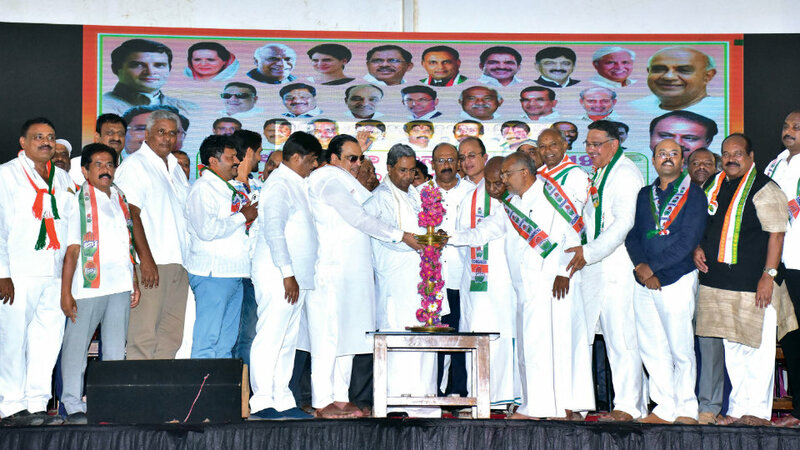 Rangappa, Abdullah and a host of other leaders from the Congress and JD(S) were present. Oh Bhrame! Come to reality. Why a negative pledge to only defeat BJP? Why not a pledge to give better governance than Bjp ??? Why do politicians make stupid statements that they know are stupid? What matters is not who wins or loses, but how the game is played! I don’t understand Congress! JDS is a very cunning party, if they get majority or not they will rule! They have already demonstrated that by taking the biggest piece of cake in Karnataka government they have tricked Siddaramiah by defeating him taking his own help Either Congress is an absolute moron or Devegowda is super smart, that Gowda is pulled off this alliance! JDS is like prostitute who is ready to change sides! What is worst for Congress is, if they don’t get enough seats JDS can comfortably change sides and in that cases, all the corruption charges agaist the Congress leaders will result in a jail terms for all the Congress leaders who are involved in corruptions! I can’t understand how Mondya Gowdas could be fooled by JDS! Learn the spelling of Mandya first, then talk about foolishness ! On the dot… On the facts.and observation . but you need to work on your spelling though. How come Raju and Samir both misspell Mandya??? ?